A number of adhesion molecules have been characterized in the recent past. Molecules belonging to three families, i.e. selectins, integrins and members of the immunoglobulin superfamily mediate major events of immune reactions.1,2 These events include migration of naïve cells to lymphoid organs (homing), adhesion of T cells to antigen-presenting cells, adhesion between effector helper or cytotoxic T cells and B cells or target cells respectively, migration of lymphocytes (as well as monocytes and granulocytes) from the blood stream to sites of immune reaction. T-cell activation and migration are obvious key phenomena in the process of graft rejection and graft versus host disease (GVHD). Adhesion molecules therefore represent logical targets for immunointervention aim at preventing graft rejection. 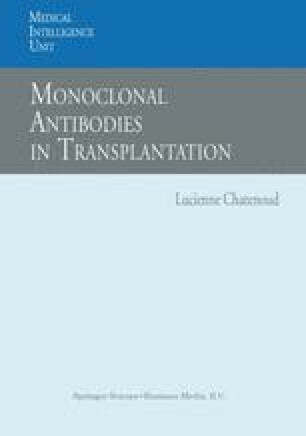 In this chapter, we review the current experimental and clinical data on the in vivo use of anti-adhesion molecule antibodies in the field of transplantation.